An adaptation by way of Orangette, where it was adapted from Kitchen Sense by Mitchell Davis. The original cake is made with chopped walnuts rather than blueberries; I think raspberries might make a good option, too. 1Preheat the oven to 375F, and set a rack to the middle position. 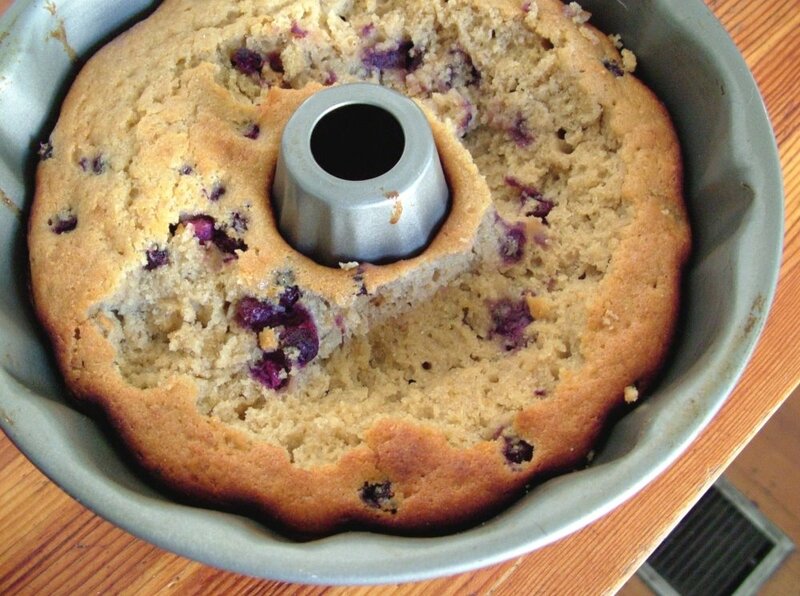 Grease and flour or generously spray a Bundt with non-stick spray and set it aside. 2In a large mixing bowl, combine the buckwheat flour, all-purpose flour, brown sugar, baking powder and salt, and mix well. 3In a separate bowl, whisk toether the eggs, buttermilk and orange zest, if you're using it. Add the butter, honey or maple syrup, and vanilla and whisk well. Pour the liquid ingredients into the dry ones, and stir just to combine. If the melted butter has clumped, whisk very briefly but vigorously to smooth the batter. Do not overmix. 4Pour 1/3 of the batter into the prepared pan. Scatter about half of the blueberries over the top. Add another 1/3 of the batter, and top with the remaining blueberries. Top with the remaining batter. Bake the cake for 25-30 minutes, until the cake rises, pulls away from the edges of the pan, and springs back when pressed gently. 5 Remove from the oven and let cool for 15 minutes before unmolding onto a wire rack to finish cooling completely.